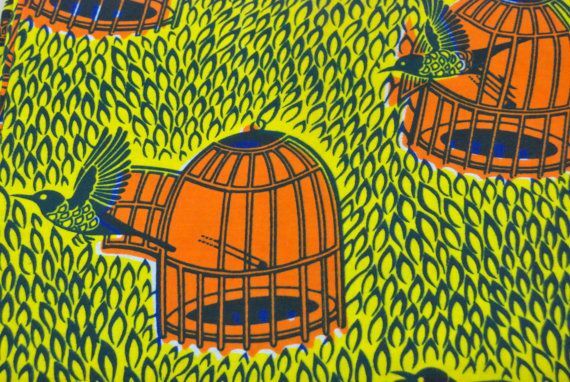 Every picture tells a story, so the saying goes, and this is true for fabric designs, especially those with such a long and colourful history as African wax prints. We know that the Dutch brought the batik method to Africa, via Indonesia, but what do we know of the emblems that appear on the patterns? How old are they and what do they signify? In amongst all that dazzling colour and bold print, it is fascinating to explore the culture behind some of the most familiar images. “You fly, I fly” is the name given to the image of a bird flying from a cage, often worn by newly-weds. Some say this is to symbolise escape from the home of origin, though others believe it is a coded warning to the new husband! Vinyl discs appear on the fabric “Gramophone”. These vibrant circles testify to a deep and passionate love of music going way back to the original record players. Tortoises are a dense and complex signifier, viewed from above with all the whorls and indentations of the shell. This ancient reptile exemplifies the qualities of patience and resilience. Birds in flight represent money. There is a warning in the name “Money has wings”, suggesting, if you don’t look after it properly, it might just fly away from you. More obvious forms of money representation would be diamonds on wax print. A design of sticks of sugarcane has the lovely meaning that the wearer is loved like the sweet treat depicted. Some symbols carry a somewhat tongue-in-cheek message, and this is definitely the case with “Stool“. The idea behind this is to take a seat and sit down if you have anything meaningful to say. Anything worth discussion deserves the time and effort to draw up a stool to sit and chat. Spirals of dots forming a circle is a very popular design, and it represents a well. The dots are the water droplets and the spirals imitate the way the water surface will ripple when a bucket is dropped into it, or the water is drawn. Water is obviously of key importance and having access to it implies confidence and good health. Fabric featuring guinea fowl might be worn for a special occasion or a feast as it is a great delicacy and enjoyed in many dishes. 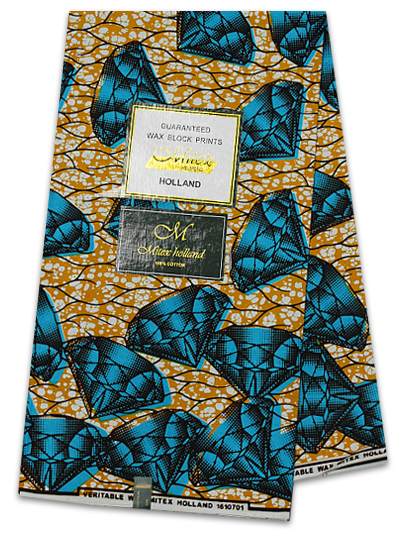 These are just a few of the wonderful stories woven into the history of African wax prints.